Visit some of the world’s most stunning locations on board Cruise & Maritime's Astor cruise ship. 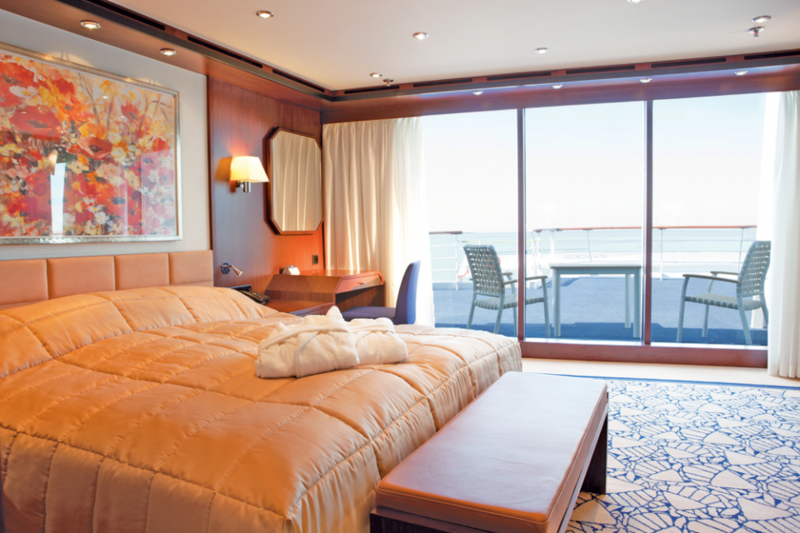 Having been extensively refurbished in 2010, Astor is everything you would expect from a Cruise & Maritime ship. With only 600 like minded travellers on board, you will be able to relax in Astor's many deck spaces and public areas, and enjoy each port of call you visit. This is an attractive modern cruise ship with a raked bow, a large square funnel and a nicely balanced and contemporary profile. It has been well maintained and refurbished over the years. Introduced by Transocean Tours in 1997, this ship was placed under a long-term charter agreement from its present owner, Preminco (which also owns a number of fine riverships). 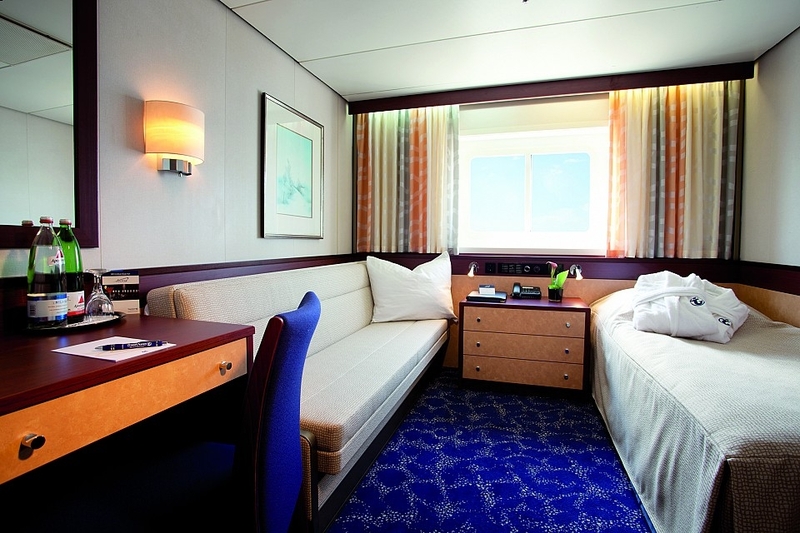 Cruise & Maritime's Astor cruise ship represents a good mix of traditional and modern styling. Its high standard of German constuction can be seen in the fine teakwood decking, polished wood railings and interior fittings, much of it refurbished in 2010. Enjoy an expansive selection of open deck and sunbathing space, plus cushioned pads for sunloungers, a large deck-chess game and shuffleboard courts on the aft deck. The public and conference rooms of the Astor are comfortable and varied, most with high ceilings. Astor boasts a showlounge, Captian's Club lounge, library, card room and two large boutiques. You will also find the Hanse Bar, with good lager on draft and an outdoor area that is a particularly popular late-night hangout. From the moment you step on board Astor, the choice is yours to join any of the many activities on offer or simply enjoy the luxury of being able to do absolutely nothing. The ship’s daily programme will be delivered to your cabin each evening, outlining the events of the following day. Maybe join the fitness team on the Sun Deck for a jog or a walk, yoga or an early game of deck-chess. Later in the day, perhaps listen to a speaker or learn a new skill from one of Cruise & Maritime's arts and crafts specialists. And, on those sunny tropical days, relax by the pool with a good book and perhaps a refreshing cocktail. When the sun goes down in the evening, pre-dinner drinks are served on the Sun Terrace with the view of the ocean and the Captain's Club where your favourite drink is ready for you. 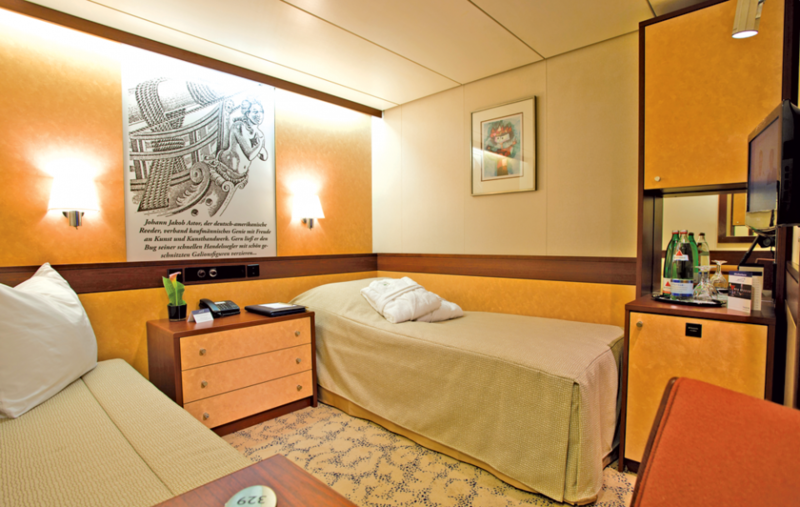 The accommodation is spread over three decks, and comprises 32 suites and 263 outside and interior cabins. 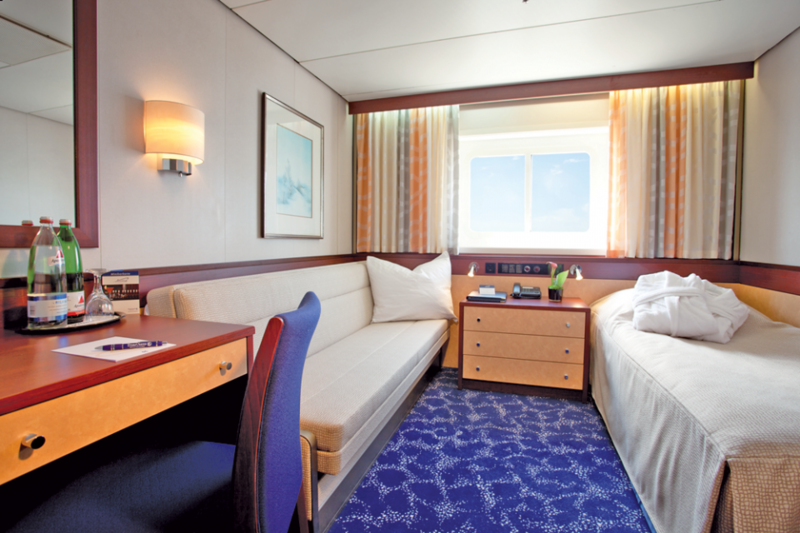 All suites and cabins with outside-view have blackout blinds. 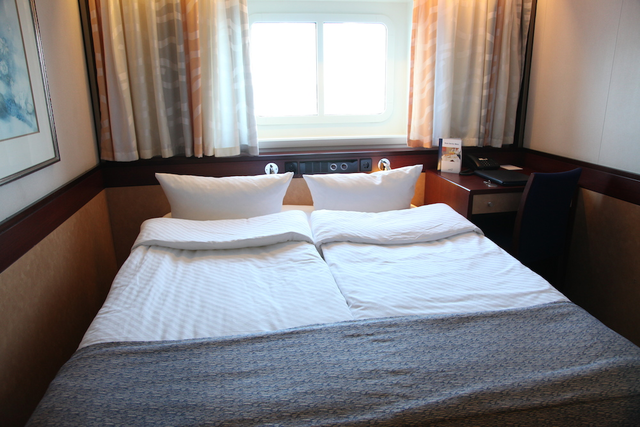 All grades come with a personal safe and minibar as well as cabin service. The Wellness oasis on board Astor contains a sauna, steam room, solarium, indoor swimming pool, beauty salon, treatment rooms and changing areas. Some of the services offered include massage, facials, manicures and pedicures. A separate fitness centre equipped with gym-machinery and exercise bikes is located on the Bridge Deck complete with ocean views. (Average size 140 sq ft/13 sq m) View Larger Image These inner cabins can be found on the higher Atlantic Deck. They comprise of two lower beds one of which converts to a sofa for daytime use. Amenities include a bathroom with shower & WC, wardrobes and drawer space, minibar, flat screen TV, hair dryer, direct-dial telephone, and personal safe. 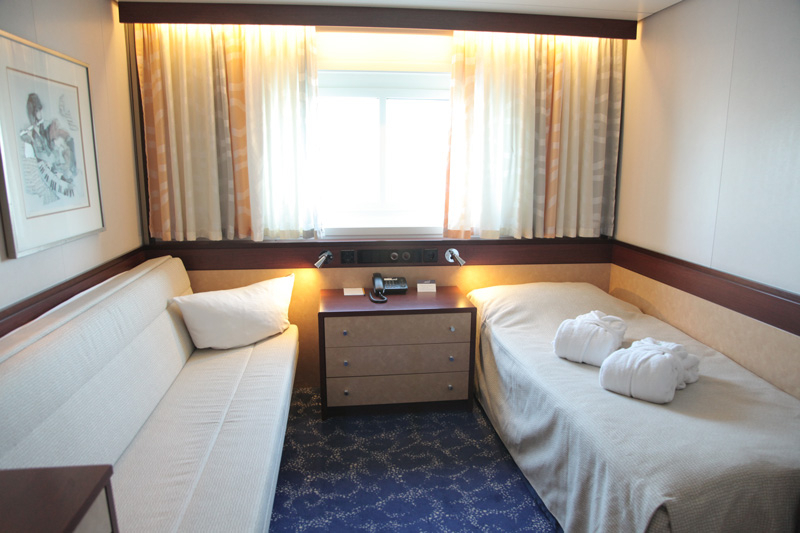 (Average size 172 sq ft/16 sq m) Located on Atlantic Decks, these cabins have three lower beds, two of which convert to sofas for daytime use, and one upper Pullman berth. Amenities include a bathroom with shower & WC, wardrobes and drawer space, minibar, flat screen TV, hair dryer, direct-dial telephone, and personal safe. 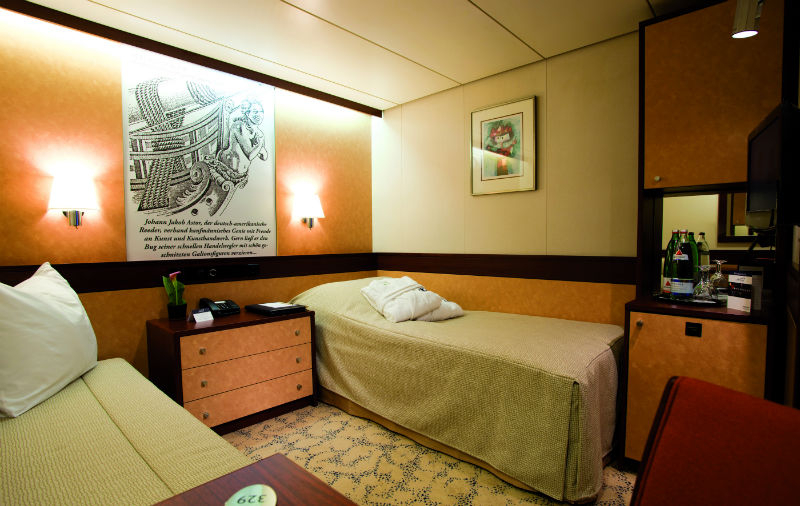 (Average size 140 sq ft/13 sq m) Four comfortable inner cabins which are centrally located on Atlantic Deck have been designated for the single traveller. With a single bed and a sofa, each has a bathroom with shower & WC, wardrobes and drawer space, minibar, flat screen TV, hair dryer, direct-dial telephone, and personal safe. (Average size 140 sq ft/13 sq m) Located throughout Baltic Deck they all comprise two lower beds, one of which converts to a sofa for daytime use. Amenities include a bathroom with shower & WC, wardrobes and drawer space, minibar, flat screen TV, hair dryer, direct-dial telephone, and personal safe. Six cabins have two additional upper Pullman berths to accommodate up to four passengers. (Average size 140 sq ft/13 sq m) Four comfortable oceanview cabins which are well located on Atlantic Deck have been designated for the single traveller. With a single bed and a sofa, each has a bathroom with shower & WC, wardrobes and drawer space, minibar, flat screen TV, hair dryer, direct-dial telephone, and personal safe. 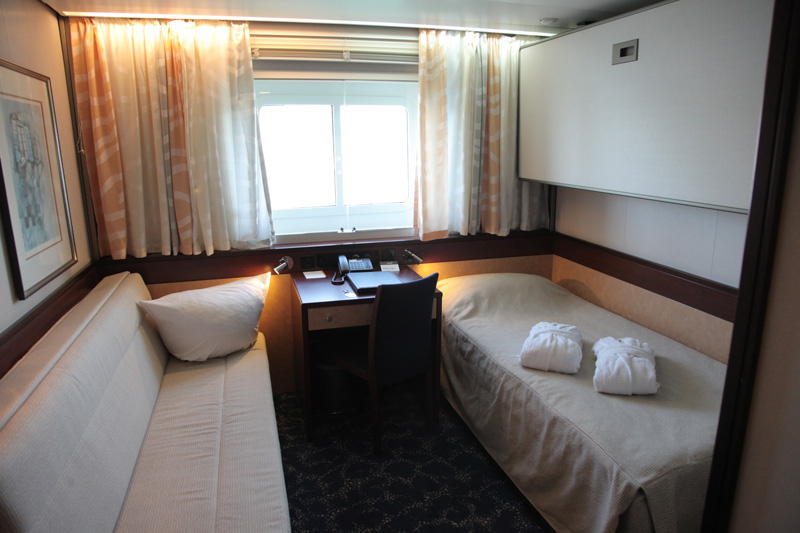 (Average size 150 sq ft/14 sq m) Also comprising three lower beds, two of which convert to sofas for daytime use, plus one upper Pullman berth, there are four of these oceanview cabins on Baltic Deck. Amenities include a bathroom with shower & WC, wardrobes and drawer space, minibar, flat screen TV, hair dryer, direct-dial telephone, and personal safe. (Average size 140 sq ft/13 sq m) View Larger Image These cabins are situated on the Boat Deck, the highest of the accommodation decks. They comprise of two lower beds one of which converts to a sofa for daytime use. Amenities include a bathroom with shower & WC, wardrobes and drawer space, minibar, flat screen TV, hair dryer, direct-dial telephone, and personal safe. 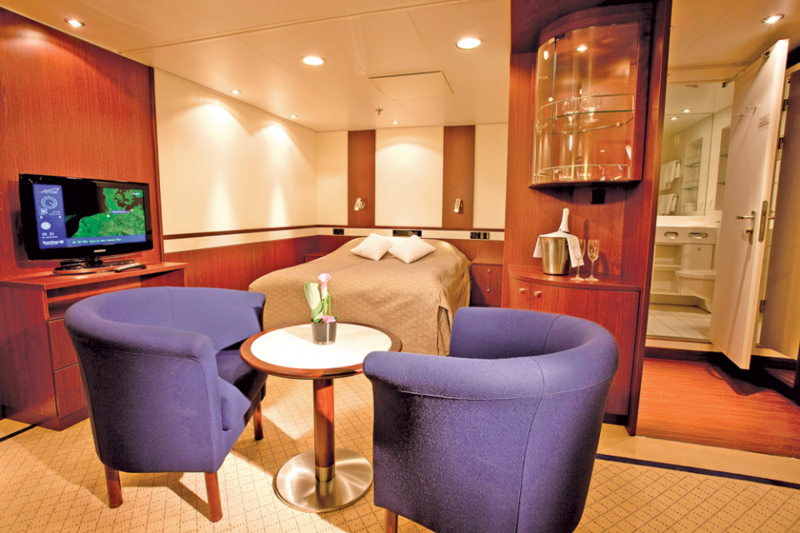 (Average size 140 sq ft/13 sq m) These oceanview cabins can be found on the Baltic Deck. They comprise of two lower beds one of which converts to a sofa for daytime use. Amenities include a bathroom with shower & WC, wardrobes and drawer space, minibar, flat screen TV, hair dryer, direct-dial telephone, and personal safe. 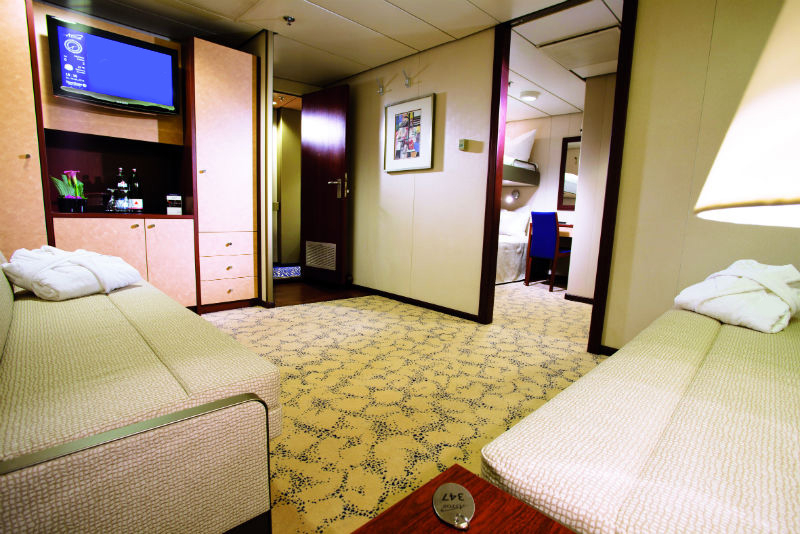 (Average size 140 sq ft/13 sq m) These oceanview cabins can be found on the higher Atlantic Deck. They comprise of two lower beds one of which converts to a sofa for daytime use. Amenities include a bathroom with shower & WC, wardrobes and drawer space, minibar, flat screen TV, hair dryer, direct-dial telephone, and personal safe. (Average size 140 sq ft/13 sq m) Situated in the forward and aft areas of the Baltic and Atlantic Decks, these cabins have twin lower beds and benefit from ocean views. Amenities include a bathroom with shower & WC, wardrobes and drawer space, minibar, flat screen TV, hair dryer, direct-dial telephone, and personal safe. Twelve cabins have additional upper Pullman berths to accommodate a third and in some cases a fourth passenger. (Size 635 sq ft/59 sq m) View Larger Image Indulge yourself with a stay in the exclusive Astor Suite that offers stylish accommodation yet provides an elegant retreat in its prime position on the Boat Deck. The generous space comprises separate living and sleeping areas, a double bed, floor-to-ceiling windows to the bow, a private balcony, direct access to a large terrace forward on Boat Deck, a large luxurious bathroom area with WC, bathtub, shower and underfloor heating, walk-in closet, wardrobes and drawer space, minibar, coffee maker, two flat screen TVs, hair dryer, direct-dial telephone, and personal safe. (Average size 280 sq ft/26 sq m) View Larger Image There are eight spacious inner suites situated on the Atlantic Deck and a further three located on the Boat Deck. They offer stylish interior design, double beds, a sitting area, a bright bathroom area with WC and shower, wardrobes and drawer space, minibar, flat screen TV, hair dryer, direct-dial telephone, and personal safe. 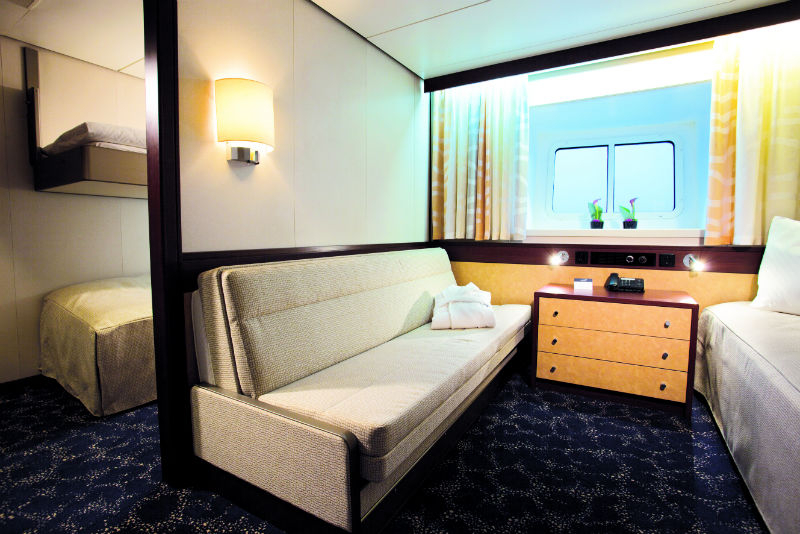 Four of the Atlantic Deck suites have an additional sofa bed to accommodate a third passenger. (Average size 280 sq ft/26 sq m) View Large Image There are eight spacious De Luxe suites situated in a favoured position on the Boat Deck. They benefit from stylish interior design, double beds, a sitting area, floor-to-ceiling windows, a bright bathroom area with WC and shower, wardrobes and drawer space, minibar, flat screen TV, hair dryer, direct-dial telephone, and personal safe. (Average size 516 sq ft/48 sq m) View Larger Image There are just two Senator suites which are located in a prime position on the Boat Deck. The generous space comprises separate living and sleeping areas, a double bed, floor-to-ceiling windows to the bow, a private balcony, use of a large terrace forward on Boat Deck, a large bathroom area with WC, bathtub, shower and underfloor heating, walk-in closet, wardrobes and drawer space, minibar, two flat screen TVs, hair dryer, direct-dial telephone, and personal safe. 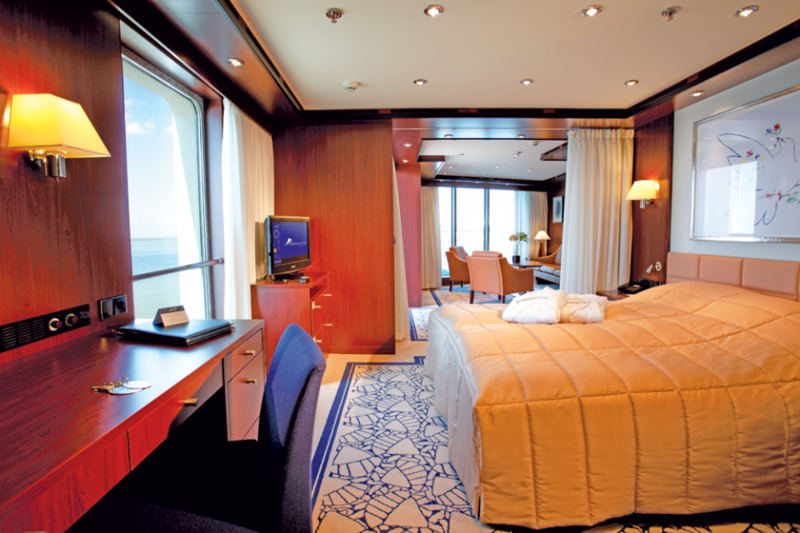 (Average size 280 sq ft/26 sq m) There are twenty spacious Premium suites centrally located on the Atlantic Deck. They offer stylish interior design, double beds, a sitting area, floor-to-ceiling windows, a bright bathroom area with WC and shower, wardrobes and drawer space, minibar, flat screen TV, hair dryer, direct-dial telephone, and personal safe. 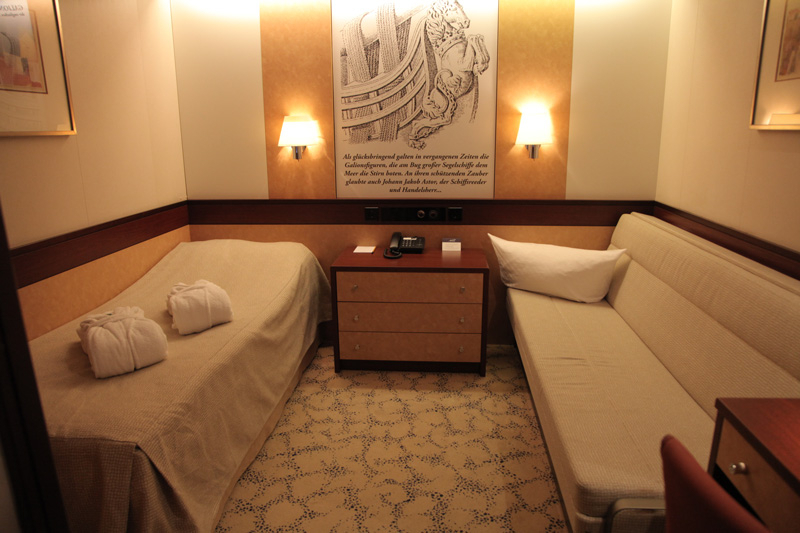 Seven of the Premium suites have twin lower beds rather than a double bed for those who prefer that arrangement.